The new ministers may only be on the job for a few weeks, but today B.C. Premier Christy Clark brought several new faces into her cabinet — while it lasts. Premier Christy Clark has unveiled her new cabinet, which includes five new members and a raft of returning faces for the few weeks before her minority government is expected to be challenged by the NDP-Green alliance. Two newly-elected MLAs are joining cabinet: Ellis Ross, a former chief councilor for the Haisla Nation, and Jas Johal, a former TV news reporter and LNG industry spokesman. Also joining cabinet are Sam Sullivan, the former Vancouver mayor and MLA for Vancouver-False Creek, Jordan Sturdy, the former Pemberton mayor and MLA of West Vancouver-Sea to Sky, and former speaker and long-serving Richmond MLA Linda Reid. Rich Coleman — deputy premier, Energy and Mines. Mike de Jong — Finance. Andrew Wilkinson — Attorney General and Justice. Todd Stone — Transportation and Infrastructure. Mike Morris — Public Safety and Solicitor General. Stephanie Cadieux — Children and Family Development. John Rustad — Aboriginal Relations and Reconciliation. Shirley Bond — Jobs, Tourism and Labour. Steve Thomson — Forests, Lands and Natural Resource Operations. Ellis Ross — Natural Gas Development, Housing. Linda Reid — Advanced Education. Coralee Oakes — Small Business. Sam Sullivan — Community, Sport and Cultural Development. Michelle Stilwell — Social Development and Social Innovation. Jas Johal — Technology, Innovation and Citizens Services. Donna Barnett — minister of state for rural economic development. Clark had six spots to fill left vacant by members who retired, including former health minister Terry Lake, or who were defeated, including former justice minister Suzanne Anton. The job of emergency preparedness minister, previously held by former North Vancouver-Lonsdale MLA Naomi Yamamoto, was not filled. 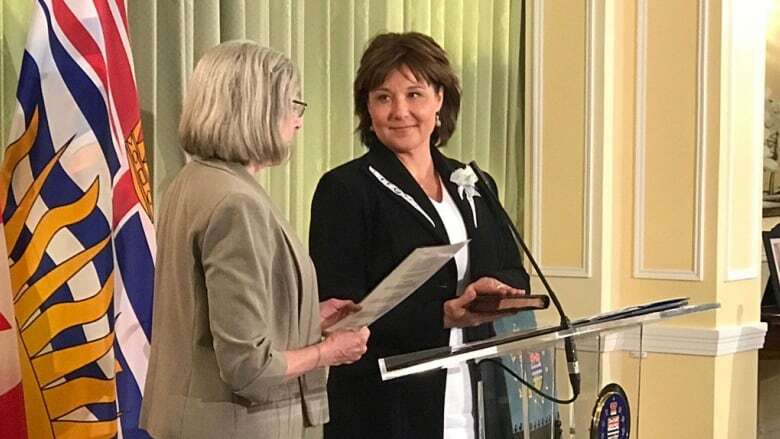 Clark said it was necessary to do a complete swearing-in of herself and the cabinet, despite the fact she expects to lose a confidence motion later this month that would likely result in the NDP forming government. "Our advice from the ministry of justice is yes, everybody needed to be sworn in again," she said. "We have a responsibility ... to be prepared for that outcome, and to be prepared if we don't face that outcome. We're in caretaker mode. We're not proposing new policy changes ... but we do have a responsibility to be in the house, and to be able to answer questions in the house for the length of the session, as long as it lasts." Christy Clark gets 1st chance to govern — but how long can it last? The legislature will convene on June 22 and a speech from the throne will be given by Lt.-Gov. Judith Guichon. While there had been speculation no one from the B.C. Liberals would run for Speaker — thereby heightening the potential of government paralysis — Clark said Monday her party would provide a candidate. "Whichever side of the house is in government has a responsibility to ensure a Speaker. As long as we're in government, we'll ensure there's a Speaker," she said. Left unsaid was how long her party would be in government. "It's altogether likely that government will not win that confidence vote, but we have a responsibility, I have a responsibility, as premier, to ensure stability through these very uncertain times," said Clark. "We don't know what's going to happen. This is British Columbia, after all."